If your property experienced an interior water leak, chances are that you have some water soaked drywall on your hands. If so, you will need to take immediate action to resolve such damage in order to preserve the structural integrity of your home or building. 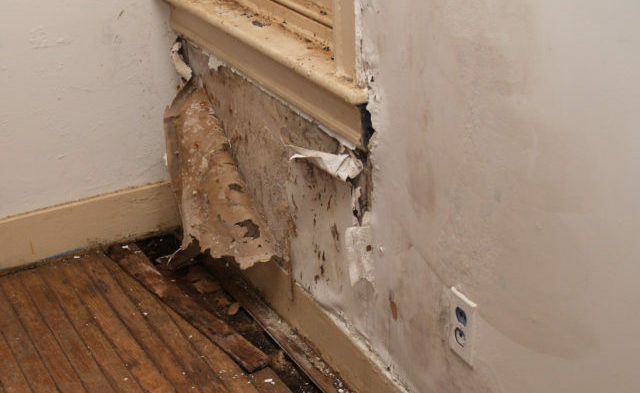 Waiting too long to repair water damage can lead to dangerous mold growth, electrical problems, and more. Continue reading to learn the basic steps to removing water damaged drywall, and who to call for trusted drywall replacement services near you. It is important that you have experience in the construction industry when it comes to removing water damaged drywall. Not only will you need to ensure your work is correct and up to code, you may also require professional assistance from a plumber and electrician before any drywall and insulation replacement can ensue. Furthermore, you wouldn’t want to accidentally take out a load-bearing wall or disturb any plumbing and electrical systems. This is especially important after a major flood or water leak. It is strongly encouraged to hire a professional company for water damaged drywall repair. If you are confident in your construction skills, you can get the project started by removing the water damaged areas of drywall soon after discovering the leak. Below you will find a list of what you will need and which steps to follow. If you have any questions, contact a licensed Indianapolis drywall contractor for professional advice and assistance. First, put on all of your personal protective gear, including gloves and safety goggles. Then prepare your work space by setting up all your materials and laying down protective floor and furniture coverings where needed. To protective floors and furniture, you can use plastic tarp or old bed sheets. Next, mark the wall. Start at the floor and make a straight line up. You want to remove all water soaked areas, but keep in mind that you will need to go farther than where the drywall is wet since water travels upward. So make your line extend up 2 to 4 feet above the visible wet drywall. Do this on both sides so that you have two vertical lines parallel to one another. Connect them at the top, making a large square around the entire affected areas. Take your utility knife and score the drywall along your marked lines, inserting the knife only halfway through the thickness of the wall. Using your hammer, carefully tap out a hole in the drywall directly beneath your top score line. Then insert your fingers into the hole and gently pull back and forth on it to loosen the affected areas away from the studs behind them. Then just manually pull out the damaged drywall and fill up your garbage bags. Now that you have your giant hole in the wall, your next step is to remove all of the water soaked insulation. Be meticulous here, and really try to remove all of the damaged insulation, soaked and mildly damp. Water soaks into insulation deeply, allowing it to travel much further than in drywall. If you are not sure whether or not the insulation needs to be removed, remove it all. It is very cheap to replace, so it is better to be safe than sorry. With all the water damaged wall and insulation removed, you are ready to set up your fans and blowers. Allow them to dry the area for 48 to 72 hours, or longer if need be. This should sufficiently increase air flow behind the walls and dry out the wooden studs and sub-floors. Set up your moisture meter as well to monitor the moisture levels around the affected area. Call Drywall by Local Builders at 317-269-7319 for professional drywall replacement in Indianapolis and its surrounding areas. We are experienced drywall contractors who offer a wide range of residential and commercial drywall service, including repair, replacement, installation, new home construction, metal stud framing, custom drywall texture, grid ceilings, and much more. Call 317-269-7319 to request a free estimate, today. Stubborn old wall anchors can be extremely frustrating when it comes time for them to be removed. In fact, many homeowners are nervous to try it on their own because they fear damaging the surrounding drywall. If you have old drywall anchors that need to go, but you also feel intimidated by the task, you are in the right place. Continue reading to review a simple, step-by-step guide for removing unwanted wall hangers all on your own, safely and efficiently. It is important to gather all your items and supplies before you start. The gloves will protect your hands from scratches or blisters, while the towel can be laid on the floor below to manage any drywall mess. It is also important to choose the correct drill bit size for the best results. If you do not have a full set of drill bits, simply purchase one that is a couple sizes larger than the opening in the wall anchor. Keep in mind that if you plan to paint the wall you are working on, you will first need to prime the patched areas where the wall anchor holes were. And if you are planning to install new drywall anchors, be sure to buy ones that can be easily removed for future convenience! ❶ Remove the screw from the wall anchor. ❷ Place the bit inside the center hole of the wall anchor and begin slowly drilling. Use a drill bit that is two sizes larger than the width of the center hole of the anchor. The bit should sit perfectly outside of the edge of the hole, without slipping inside. ❸ Once you begin drilling, the collar of the wall anchor should break free from the wall and automatically push itself out. Let it fall on the floor so you are not tempted to grab it while the drill is rotating. Be careful not to let the bit push deep into the wall cavity, which can interrupt electrical wiring or plumbing pipes. ❹ Push the residual drywall material back into the hole using your putty knife. You may have to fill this hole in stages for best results. ❺ Sand, prime, and paint! Whether your drywall needs are on commercial or residential scope, your search for reliable and proficient service is over! You can get professional drywall installation and repair at a competitive price when you call Drywall by Local Builders! 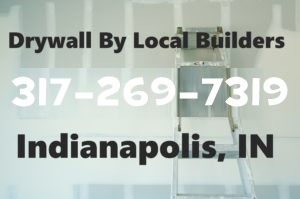 Drywall by Local Builders is a locally owned and operated drywall company based out of Indianapolis, Indiana. Our highly-trained drywall contractors are licensed, insured, and bonded, with more than a decade of hands-on experience in the industry. We offer a wide range of drywall services for both residential and commercial properties, and for municipal and governmental properties as well! Drywall by Local Builders is fully-equipped and staffed to manage any drywall project, regardless of size or scope. We are proficient in everything drywall, from simple drywall installation and repair, to major work like new construction homes, grid ceilings, metal stud framing, custom drywall textures, remodels, basements, and more! In fact, we are happy to discuss your questions and concerns, anytime. All oyu have to do is give us a call! You can feel free to contact our office at 317-269-7319 and speak with a licensed Indianapolis drywall contractor, directly about your drywall or home remodeling needs. When you call Drywall by Local Builders, you can expect a prompt hello and a warm greeting, every time. We are industry professionals who are eager to answer all of your drywall questions! Request a free estimate, information, or referrals, today! Call Drywall by Local Builders at 317-269-7319 for professional Indianapolis drywall repair at an affordable price. We are highly-trained and licensed drywall contractors that offer a wide range of drywall services for residential and commercial properties. Trust us for outstanding results at a competitive price! Call 317-269-7319 to request an estimate for Indianapolis drywall repair, today. Whether you prefer crown, base, plinth, chair, or rosette, moulding provides a decorative and functional accent. 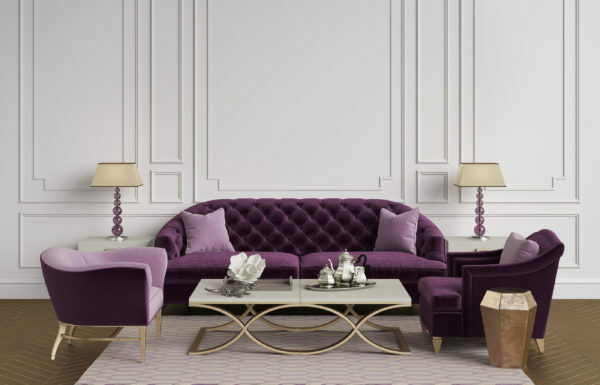 When added to any room, it can instantly transform a dismal environment into a stunning, elegant space. As a highly-versatile home furnishing, it can be installed on walls, ceilings, bases of floors, around doors and windows, and much more. In fact, it is so versatile that it comes in various styles and designs, all of which ranging in look, size, quality, texture, and more. A first step in choosing the right moulding for your home or office is deciding on a species or material. Traditionally made of wood, moulding is now available in several alternative materials too. Continue reading to learn the most popular species and material options for moulding. ➀ Aspen – Aspen is a soft wood that has a straight grain and fine uniform texture. It is commonly used for more decorative moulding silhouettes. ➁ Fir – Fir is a wood species with two grain patterns: mixed grain and vertical grain. Mixed grain is course, and comes in light to dark hues. Vertical grains have tighter grain patterns and less color disparity. It generally requires staining prior to application. ➂ Medium Density Fiberboard – Also recognized as MDF, medium density fiberboard is a high-grade, composite material commonly used for moulding because it is durable and easy to paint. ➃ Oak – Oak is a hardwood that, when applied in the moulding manufacturing industry, it primarily derived from Red or White oak trees. It has attractive grain pattern qualities and it is very easy to work with. ➄ Pine – Pine is a wood species that, in the moulding manufacturing and consumer industry, is appealing for its unique textures and random knots. ➅ Poplar – Poplar wood is among the most preferred in the design industry because of its natural crisp grain lines and rich wood tones. ➆ Primed Finger Joint Products – Speaking of pine and poplar, primed finger joint products are derived from both. It is engineered moulding comes in smaller pieces that must be fitted together to make a whole board. ➇ Polystyrene – This is a prefinished moulding admired for its light weight and easy workability. They are slightly flexible and moisture resistant, making them a great choice for “untrue walls” and rooms that have higher levels of moisture, like kitchens and bathrooms. 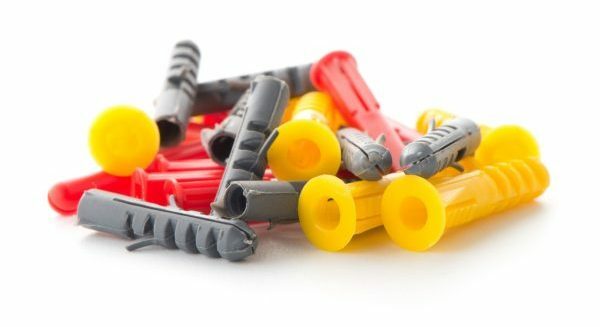 ➈ Polyurethane – Polyurethane moulding is a man-made material composed of high-density polyurethane. It is warp, rot, and split resistant, making it a prime choice as an alternative to wood materials. ➉ PVC – PVC, or polyvinylchloride, is another man-made material that flawlessly mimics the look of wood. It’s a popular choice because it’s easy to cut and install. Call Drywall by Local Builders at 317-269-7319 to request a free estimate for drywall installation in Indianapolis, Indiana. We offer a wide range of drywall services, for both residential and commercial properties, including new construction homes, remodels, repairs, metal stud framing, ceiling grids, and of course, moulding installation. Request a free estimate, today. After some time, old wall anchors can become more unattractive than useful. When this happens, it is possible to repair the problem all on your own. Continue reading to learn how to get rid of pesky wall anchors in just 3 easy steps! If your drill bit set is not complete, you at least need to have one that is around two sizes bigger than the wall anchor opening. 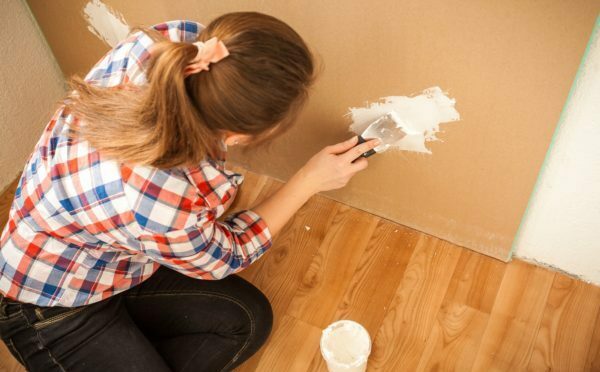 If you plan to paint the wall afterwards, be sure to plan for enough time to dry and prime first. Furthermore, it is wise to purchase new wall anchors that are easily removable for more convenience in the future. Step ❶ ⇢ Take out the screw from the wall anchor and choose a drill bit that is 2 sizes larger than the screw hole. Step ❷ ⇢ Center the drill bit inside the screw hole and use its resistance to drill the anchor out of the wall. It is okay if it falls into the wall cavity. Special Note: Do not use too much pressure and maintain constant control of your drill. There could be electrical wires or plumbing pipes behind the wall that you do not want to disturb or damage. Step ❸ ⇢ Use your putty knife to apply drywall compound to the residual hole in the wall and let it dry completely. You may need to fill the hole, little by little. Now all that’s left to do is sand, prime, and paint! If you are preparing to install water-proof drywall in your home, there are some things you need to know first. Continue reading to learn some basics surrounding “green board”, including what it is, what it does, and how to install it correctly. Drywall contractors often refer to water-proof drywall as “green board” because it is green. However, it is an important material because of its water and moisture-resistant qualities. For these reasons, green board is often used in rooms like kitchens, bathrooms, laundry rooms, and other rooms where moisture is frequently in the air. 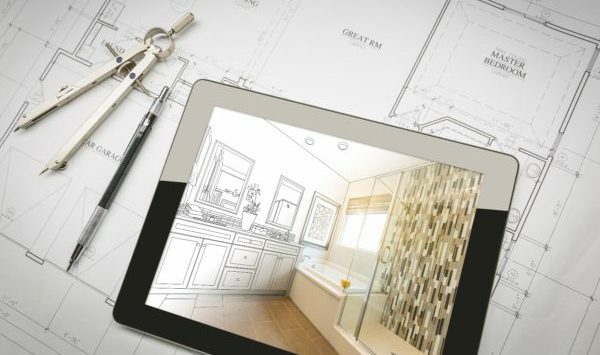 Although traditional drywall that is constructed with a gypsum-based core works well for all other areas of a home, places like bathrooms and kitchens require a specialized material that will combat the excess moisture production and retention. One of the biggest misconceptions regarding green board is that it is water-proof. The truth is that green board is water-resistant, not water-proof. Although it cannot completely stop water penetration, it is still highly resilient against linger air moisture and leakages. This type of drywall is meant for rooms that experience higher levels of humidity and moisture, however, they are not meant to be installed directly behind shower tile, underneath bathtubs, around kitchen sinks, or any other area that has direct contact with water. These areas require a different type of specialized drywall, one of the most popular being fiber cement board. When installing green board, it is important that you have the proper experience, knowledge, and resources to do so according to industry best practices and code standards. If you do not meet these credentials, it is vital that you leave green board installation to a licensed Indianapolis drywall contractor you can trust. If you have installed drywall before, then you should brush up on the fundamental steps involved in the process. Installing green board is very similar to installing regular drywall. Start by examining and measuring the area you are working with. Then be sure to score your green board accordingly. After you have scored your drywall, bend it at the markings and use a utility knife to make a clean cut on the top layer of paper. Next, attach the drywall to your framing, and connect it using drywall screws or nails in the areas where the framing aligns with the green board. Using one continuous piece of drywall tape, cover the seams between the sections of drywall. Extend the tape from top to bottom, all across the walls and in the wall corners. Now it is time to apply your drywall mud to the taped-off areas. Be sure to fill in the indents caused by your screws, too. Once the mud dries, you are ready to prime and paint! Call Drywall by Local Builders at 317-269-7319 for professional drywall installation in Indianapolis, Indiana. We are licensed, bonded, and insured drywall contractors with over 10 years of experience in the industry. Our drywall services include installation, repair, replacement, new construction, metal stud framing, remodels, and more. Request a free estimate, today. Drywall work is not “cut and dry.” There are several factors involved in making sure the job is done right. Whether you plan to install drywall on your own or hire a professional contractor, it is helpful to learn a little more about drywall repair. There are numerous questions that are commonly asked by home and business owners regarding drywall repair and installation. If you have questions too, you may find the answers below. Why is There a Crack in My New Drywall? Drywall cracks come in all sorts of shapes, sizes, depths, and scopes. And often times, the appearance or location of a crack can say a lot about how and why it showed up. The most common causes for drywall cracks include moisture, foundation settling, improper installation, blunt force impact, and heavy wall décor. Which Tools Do I Need to Patch Up a Small Hole in the Wall? The basic tool kit for minor drywall repairs should consists of at least 6 particular items. These include a putty knife, mud pans, sanding sponge, sandpaper, drywall tape, and corner tools. You can find these supplies at any local home improvement or hardware store, such as Lowes®, Menards®, and Home Depot®. Which Drywall Materials Can Reduce Noise? Unfortunately, there are not many drywall manufacturers that provide noise reduction options. However, there happens to be 4 particular brands on the market that are specially manufactured for optimal noise reduction and control. These brands include QuietRock®, QuietWood®, QuietCoat®, and Soundbreak® XP®. Are There Different Types of Drywall Spackle? There are various types of spackle available for drywall work and repair, but each one has separate qualities that meet certain drywall patching needs. The two basic categories of drywall mud are quick-setting and premixed. Quick-setting drywall mud is also referred to as “hot” mud because a chemical reaction occurs during the curing process that causes heat release. Premixed drywall mud is the more common or traditional drywall spackle, probably because it is ready to use. Can I Install Drywall Myself? Even for the most enthusiastic do-it-yourself or home improvement buff, drywall installation is best left in the hands of a professional. 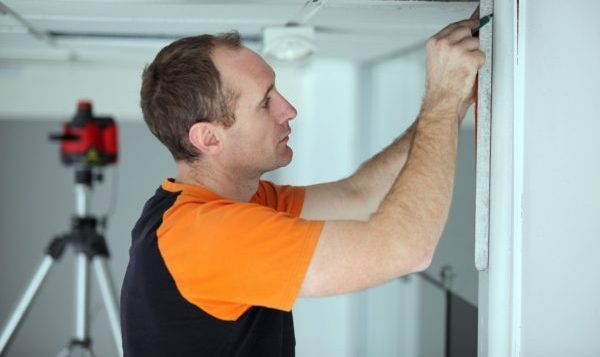 Not only is it safer and more cost-effective to hire a professional Indianapolis drywall contractor, it guarantees professional-grade results in an efficient time frame. 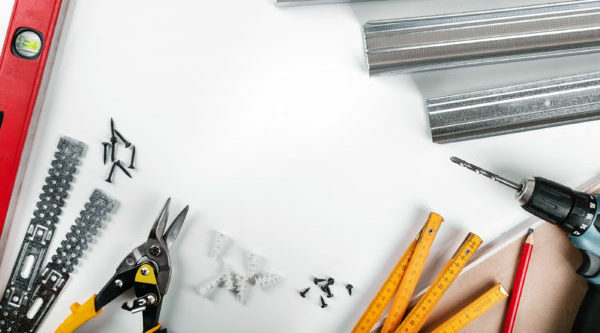 It requires more than just the proper tools, training, and knowledge to achieve a good drywall job, it also takes resources, connections, experience, and more. Where Can I Find Trusted Drywall Repair Near Me? Do you have a small to medium-sized hole in the wall? No worries! Holes these sizes are something you can likely fix yourself! However, if you are self-proclaimed disaster at handyman work, or the hole is larger than your two thumbs put together, it may be best to just hire a contractor for professional drywall repair. If you are sure you can handle the job yourself, keep in mind that holes larger than the palm of your hand will require a more comprehensive set of instructions, as well as, a separate set of materials. If you have a small to medium-sized hole in the wall, continue reading to review a brief instructional guide on how to patch it up like new! Use your blade knife to clean up the edges of the hole. Try to cut at an angle so that the interior of the hole is narrower than the hole. Use your painter’s putty and putty knife to fill the hole. Use your putty knife to smooth out the surface. Make it level to the wall. Allow the putty to dry completely. When entirely dry, lightly sand the area until smooth and level to the rest of the wall. Use your trowel to apply spackle (drywall compound) over the patch to cover the putty. Again, make sure to smooth it out so it’s level with the wall. Allow the drywall compound to dry completely. Then gently sand the area until smooth and level to the rest of the wall. Special Note: You may need to repeat step 4 and 5 again. Once the spackle is finished, you can paint over the spot and enjoy your accomplishment! Start by sanding the surface of the hole until the edges are smooth. Use a clean cloth rag to gently wipe the dust away. If your hole is more on the medium in size, you will need to use a mesh drywall patch in place of painter’s putty. Peel the paper backing off the patch, and then firmly apply it directly over the center of the hole, with the mesh side facing outward. Use your trowel to apply spackle (drywall compound) over the patch to cover the mesh drywall patch. Try to gradually thin out the edges to create a smooth, even surface. Special Note: You may need to repeat step 3 and 4 again until you can no longer detect a difference in the wall.